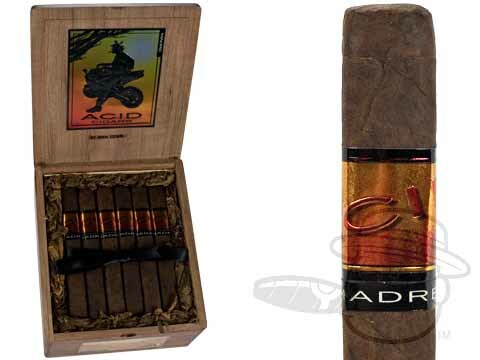 Each Acid Subculture Madre cigar showcases a dark and alluring San Andres Maduro wrapper and is aged for a full two years prior to release to allow its dense flavors to mature properly. This radically rich, box-pressed cigar offers the perfect chocolate and coffee notes to complement the rich, spicy infusion of the Acid Red line. Medium-to-full in body, Acid Subculture Madre is a magnificently well-rounded and aromatic smoke in a 6 1/4x 54 Box Pressed Toro vitola. For the price it was a good smoke. This cigar taste like a mild traditional cigar without any of the sweet notes such as Toast. If you are looking for an Acid that you can taste the infusion go with Toast or Kuba Kuba . Just smoked my first one of the box and it was a really great cigar. Well constructed, great burn and lots of flavor. But, none of the infusion flavor that you want in an Acid. I'll smoke (and enjoy) the whole box, but next time I'll order the Sancho Panza Maduro and with the money I save buy a box of Kuba Kuba Maduro to have my Acid treat. So, if you are looking for a really good box-pressed maduro (with the tiniest hint of flavor) this is a great cigar....just not the best bargain. Sticks are perfectly packaged and received in lightning time. Prices are reasonable. These cigars from Drew Estates are an excellent choice. Always excellent quality and flavor. All Acids are good, if not great, smokes...save the ExOrd Larry---too oily/smoky. You have to love the acjid line of infused cigars. Acid Subculture Madre is rated 4.6 out of 5 based on 11 customer ratings.